Stupid signs - To grrr, or not to grrr? That is the question. We have a dozen construction sites on campus and found this. Brilliant. This is very funny! Like directions to no man's land. It's also a lot like the way our mind works. I think I will borrow this one if you don't mind. Good for teaching stuff. It's all yours, little brother. That's not quite the same level of cognitive dissonance as the "push on the left side to open" door with an "EXIT" sign with a big arrow pointing to the right on it (above the push-bar) at the bototm of the stairwell in the EECS building at college, but it's close. Oh... oh... oh, you're just begging me to make a joke about UNC, aren't ya? 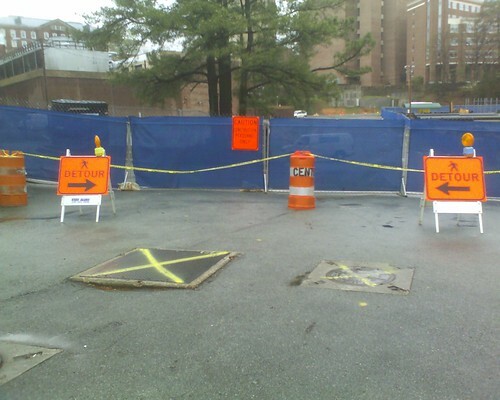 Oh, btw, that's the construction company--not UNC-CH. Taxpayer dollars at work. sit on a pole and wait??? Actually, I almost asked someone to stop and pose for the picture with a frustrated gesture. But, I had a meeting to get to. Oh, that is hilarious!!! Stupidity should be painful. Um, Did Ed forget his meds today??? Oh well I'll just stand here in the middle and look pretty!